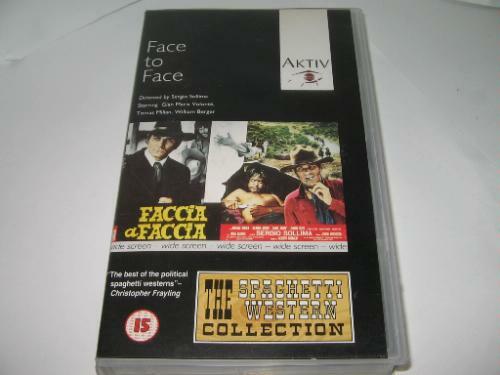 Tribe wrote: Faccia a faccia has finally shipped from Amazon UK! Wow, what a wait! They've had stock since before the release date. And we've had it for 10 days now, did they give you any indication as to what the delay was? Let me know and I'll look into it. No big deal for me. But I placed my order back in October. Since then I received two emails I believe delaying the release. But there was no other explanation. I'm just happy it's on its way. Amazon does seem to have these bizarre delays - I remember they took ages to send out some of the BFI Flipside titles that HMV customers had had since before the official release date. Last edited by Nothing on Thu Jun 23, 2011 5:04 am, edited 1 time in total. The previous UK VHS was of the drastically shorter cut, so if Eureka had gone down that route they'd presumably have had to create a bodge job along the lines of various editions of Deep End - i.e. with over fifteen minutes of the soundtrack reverting to subtitled Italian. In any case, the primary soundtrack is clearly the Italian one - the lip-sync makes it clear that it was the language being spoken by both Gian Maria Volonté and Tomás Milián on set, and this also seems to be true of much of the supporting cast. Granted, it's incongruous in that the film is set in Texas and the characters are meant to be American or Mexican, but this isn't a Once Upon a Time in the West situation (i.e. where the best soundtrack is clearly the English one). Without any yanks in the cast the Italian is no doubt more authentic, but since the films were set in the US and (badly) post-dubbed anyway I generally prefer English dubs for spaghettis - or at least to have the option. It has anyway become a convention to offer a dub track on English-language spaghetti western releases, using subtitles to cover any previously-missing segments (see numerous Anchor Bay and Blue Underground releases). An English language track would probably increase sales too - and, in my case, would have been a reason to double dip. Still, at least this will open up the film to folks who may have overlooked the German Sollima boxset, now OOP it seems + if the figures on this are okay, perhaps Eureka would consider releasing the even-more-miraculous political spaghetti TEPEPA, written by Franco Solinas (The Battle of Algiers, Salvatore Giuliano, Kapo, Queimada, The Savage Innocents, A Bullet for the General, Mr. Klein, Hanna K.), again scored by Ennio Morricone and starring the underrated Tomas Milian + Orson Welles, whom rumour has it co-directed some of the film with Petroni (Death Rides a Horse). There's a pretty decent Italian DVD of Tepepa which I picked up in Bologna a couple of yeras ago. It has English and Italian language options - sadly no English subs for the Italian, but It does also come with the Morricone CD soundtrack and can be picked up pretty cheap on Amazon and eBay. And if your Italian is good enough, there's an audio comentary from driector Giulio Petroni. Oh yes, sorry, my mistake, I saw the 'other buying options' on Amazon, but didn't see it was for the VHS. Could be worth a release by Eureka, especially if they can use the commentary and subtitle it. Yeah, even if no HD elements were available (but who knows?) they could just port the Italian DVD and add subs and it'd already be a more complete release than Faccia a faccia. This would also be the first English subtitled DVD release of Tepepa anywhere in the world. Alex Cox wrote: TEPEPA (a.k.a. BLOOD & GUNS, 1968) is an excellent Mexican Revolution story, directed by Giulio Petroni. John Steiner is a wooden gringo, but Tomas Milian as the social bandit and Orson Welles as the reactionary army colonel are outstanding. They have good debates about power and the Revolution, and their showdown is strongly acted and well staged. Francisco Marin's location photography turns Tabernas, Albaricoces, and Guadix into the white-walled Mexico of the 1920s. Much irony and moral ambiguity; very influential on Leone's DUCK YOU SUCKER. Only Damiano Damiani's QUIEN SABE? / A BULLET FOR THE GENERAL (1966) is better. I guess it's okay to post Bounty films here too? I thought I'd add the note that Noboru Iguchi is the director responsible for a couple of films that could be bracketed with Tokyo Gore Police in the over the top violence stakes - Machine Girl and Robogeisha. In fact the director of Tokyo Gore Police, Yoshihiro Nishimura, also worked as visual effects supervisor on all these films (amongst many others including Tomie: Rebirth plus Sion Sono's Suicide Club, Love Exposure, Exte and Cold Fish), and according to imdb both of them are working as kind of a collective known as the Fundoshi Corps. I'll also be very interested to see how Tomie: Unlimited reboots that series. This series hasn't really made it to the UK yet but Adness Entertainment released most of the first cycle of Tomie films (Tomie, Tomie: Replay, Tomie: Rebirth, Tomie: Forbidden Fruit etc) on DVD in the US (and there were a few released by different companies too - i.e.Tomie: Beginning, which could be thought of as the Ring 0: Birthday-styled 'prequel' of the series). The early 2000s series was very much in the Ring/Ju-on-mould involving young girls being haunted by a lank-haired demon woman, though the slight difference here was that it was just the severed head doing the haunting at the same time as effortlessly seducing every young man in the vicinity as well! I'm a big fan of Junji Ito's mangas, of which the Tomie series is a part (and I did like the way that the supernatural entity in this series is shown to be driving people to commit acts of violence and dismemberment out against her, as if Tomie has become the ultimate twisted expression of a passive-aggressive victim figure), but have never really felt that films made of his works so far have really captured the transgressive qualities of his storytelling (it didn't help that the Tomie series was rather in the shadow of Ring but I also felt that the film version of Uzumaki, while interesting and with spot-on casting, was also a pale shadow of the epic manga). I guess I'll keep my fingers crossed in the hopes that Tomie: Unlimited may change that! Just got done with A High Wind in Jamaica and thought to say thanks for releasing. It's the funnest '80s movie the '60s ever produced. It also makes it all the more miserable of a shame that McKendrick called it quits so early. An other decade or two and he would have been the best. There's a really nice full page advert for Sion Sono's Guilty of Romance just inside the front cover of this month's Sight and Sound along with a relatively enthusiastic review of the film itself. I thought I would post also to note that the director's most well known film Suicide Club is also getting its first UK DVD release this month from a company called 'Cine du monde'. I've no idea yet what the quality will be, but at least it is being released! Come on Eureka, if you can buy the rights for Yakuza Weapon, you can get this also. And Matsumoto's follow-up Saya Zamurai, too, please (since the Japanese AGAIN haven't put English subs on their forthcoming Blu-Ray). Hammer have said that there will be a BD of Frankenstein and the Monster From Hell in 2012. Any chance at all that this will be released by Eureka to follow up their splendid Paranoiac disc? Bit of a long-shot that it will be, but it'd certainly be welcome news. RossyG wrote: Hammer have said that there will be a BD of Frankenstein and the Monster From Hell in 2012. Any chance at all that this will be released by Eureka to follow up their splendid Paranoiac disc? Isn't that one of the titles in the big Optimum set? I'd assume it would come from them than. knives wrote: Isn't that one of the titles in the big Optimum set? Nope. It was issued in the UK via DD though. Most of their other Hammer discs have since been reissued by Icon. Very nice to see a Jasper Sharp commentary on there! Although I disagree about the film review. The film does worth a watch even if its not the film of the year. colinr0380 wrote: Very nice to see a Jasper Sharp commentary on there! The commentary is on the DVD version as well, correct? I'm not too sure, and unfortunately I'm not going to be able to check for certain, since I have only ordered the Blu. The article on Twitch based on the press release seems to suggest that the commentary will be on the DVD as well, although a whole new can of worms has been opened with the discussion of whether this version of Guilty of Romance will just be the 'international version' of the film (running 112 mins, rather than 144), or whether the international version is just listed among the special features and both cuts of the film will be included. The DVD Beaver review seems to suggest only the international version is included. colinr0380 wrote: The DVD Beaver review seems to suggest only the international version is included. I noticed that difference in running time. Is one version better than the other?